A Memorandum has been signed between Ukroboronprom and the State Agency for Defense Industry of the Republic of Turkey on mutual bank guarantees. 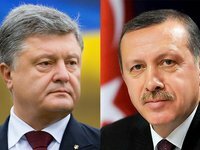 The document was signed in Istanbul on Saturday following the 7th meeting of the Ukrainian-Turkish High-Level Strategic Council under the co-chairmanship of Ukrainian President Petro Poroshenko and Turkish President Recep Tayyip Erdogan. Making a statement on the results of the meeting, Poroshenko noted the importance of deepening the MTC between the two countries, but said he would not go into details.